I did a week in outfits not too long ago, but of course I have been snapping more pictures of my outfits in recent weeks. I just like snapping a picture whenever I find myself wearing an outfit that I am liking and in recent months that has been happening a lot. I am really enjoying getting dressed in the morning and I am loving my closet at the moment. Hence lots of outfits I am wearing that I enjoy. 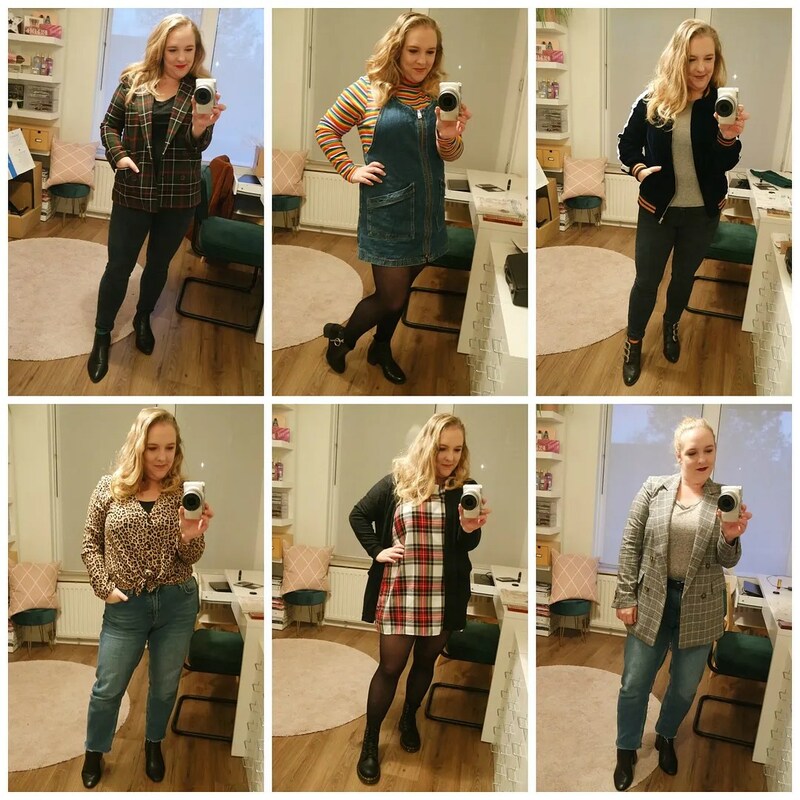 Here are 6 outfits I wore recently that I loved. As always these outfits are quite a mixed bag. However in some of these outfits I am wearing the same bottoms, yet the outfits are totally different because of what I paired with them. I hope this also shows you how you can combine the same pair of jeans in multiple ways and still look different. This first outfit is all about the navy, velvet jacket. I bought this on a whim when I visited Rome. I was doubting between this garish number and a classic grey cashmere sweater. Deciding that I have enough grey sweaters, I went with the jacket instead. 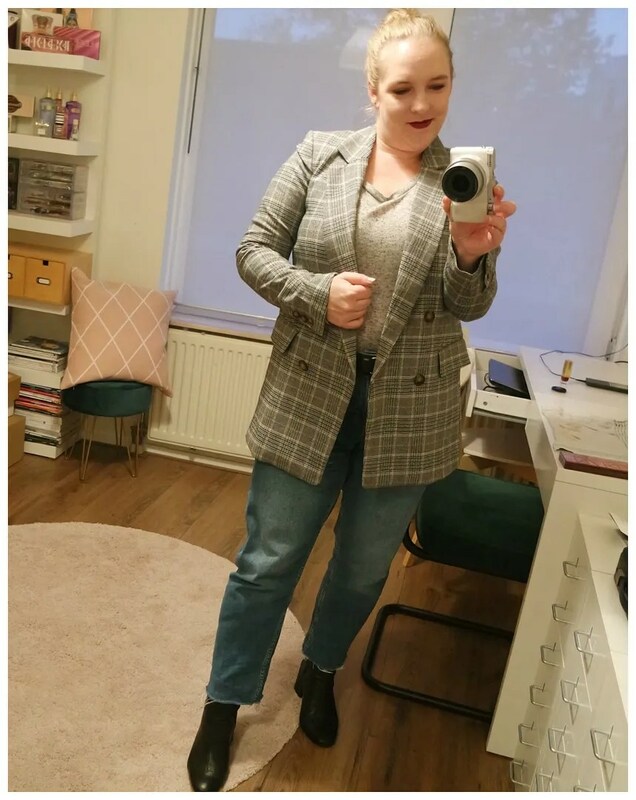 It is definitely one of the more unique pieces in my wardrobe and I have been loving wearing jackets lately. 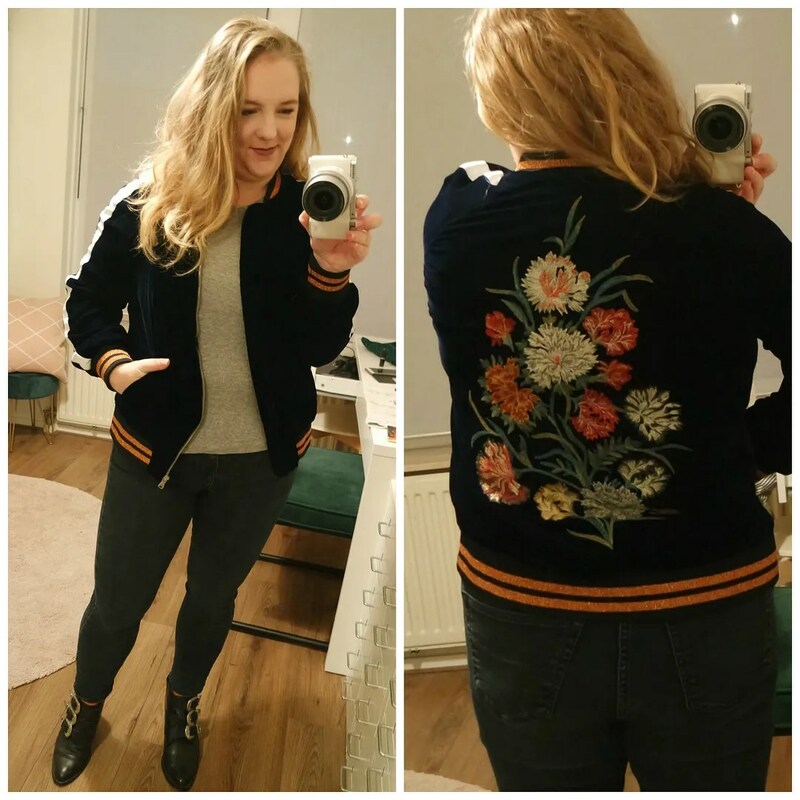 The jacket has a sportsluxe vibe, but is also made out of a velvet texture fabric and then there is that embroidered floral design on the back. A bit much perhaps, but paired with a basic pair of deep blue jeans, a plain t-shirt and black boots, I think it works. 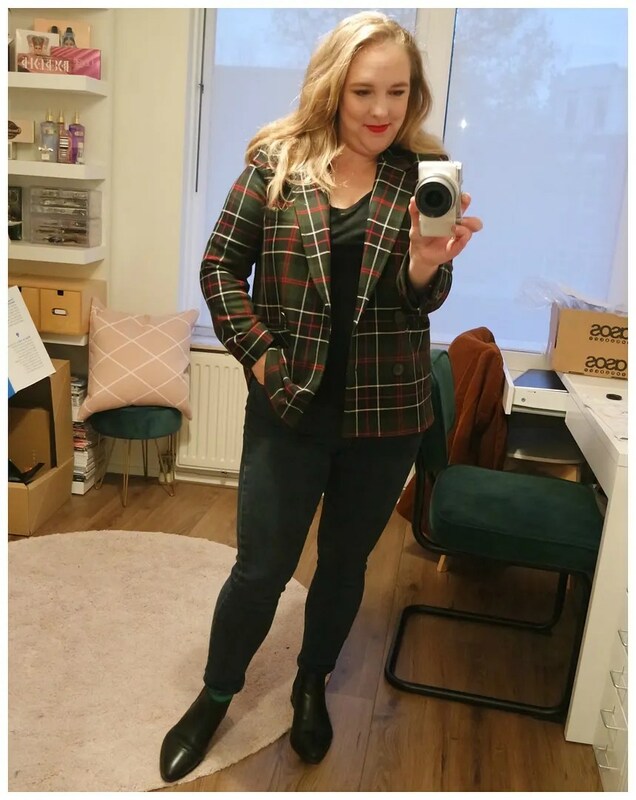 When I say I’ve been loving jackets, then this outfit shows my love for that other style of jacket: the blazer. I am really having a blazer moment and am currently on the hunt for the perfect corduroy blazer. Haven’t found it yet, but in the mean time, I am making do with this checked number. I paired it with straight legged jeans that have an unfinished hemline to keep the whole look from being too dressed up. Again, I paired it with some other basics as I wanted the jacket to be the main focus of the outfit. I am not likely to wear a lot of black, but I always love pairing this tartan print dress with blacks. 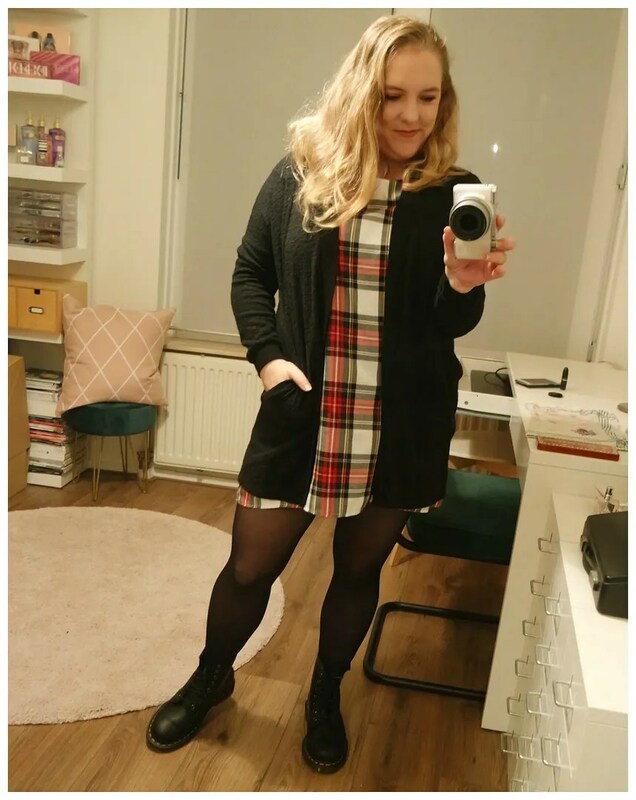 I usually wear this dress with ankle boots, but now that I have a pair of Dr. Marten’s in the black, I decided to make the tartan a bit more punk and wear those. I kept the rest of the outfit simple with a lightweight black cardigan that is a touch shorter than the dress. It makes the outfit look a lot more slimming and still keeps you nice and covered up and warm. On to some more prints then! Because I am definitely wearing a lot of prints lately. Leopard print is definitely top of the list. I am loving a bit of leopard in my outfits. 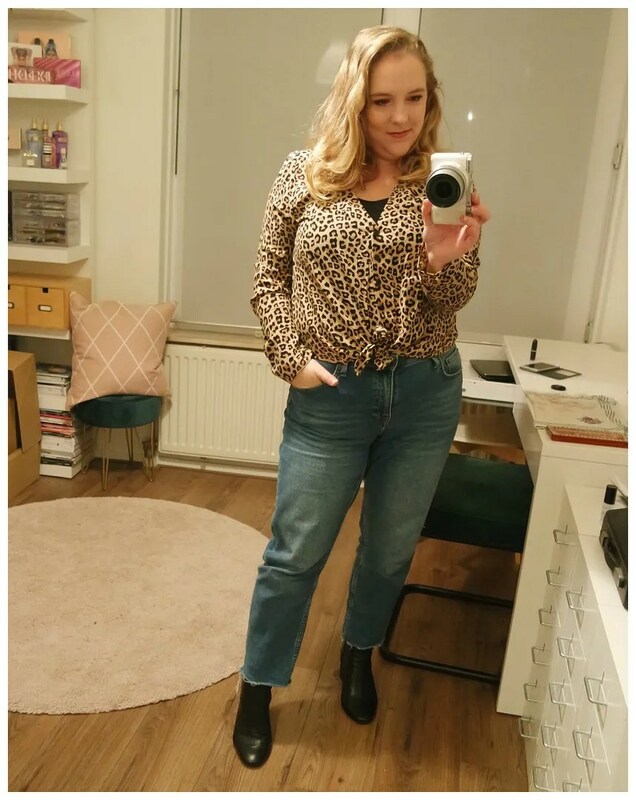 In this outfit I am wearing that same pair of straight legged jeans again as above and I have paired it with a leopard print knotted blouse. I really like this look and think the leopard goes well with the lighter blue of the jeans. Because the jeans are a bit cropped, I am wearing a pair of black sock boots which I think makes these kind of shorter jeans look great. This blazer has been popping up a few times already. I wore it during my week in outfits, but also styled it up in my fall lookbook. I am really liking this jacket. It is comfortable and just fits very nicely. Here I have styled it with some darker colors, making it much more fall. I am repeating the same dark blue jeans by Topshop here and in keeping with the shoe choice, I am wearing a black t-shirt underneath. The shoes are a pair of pointed toe Chelsea boots which work well with this look I feel. The last outfit features one of my fall favorite outfits: a pinafore with a turtleneck underneath. I have a few pinafores now, but this denim one has been a great investment last spring. I am still wearing it! 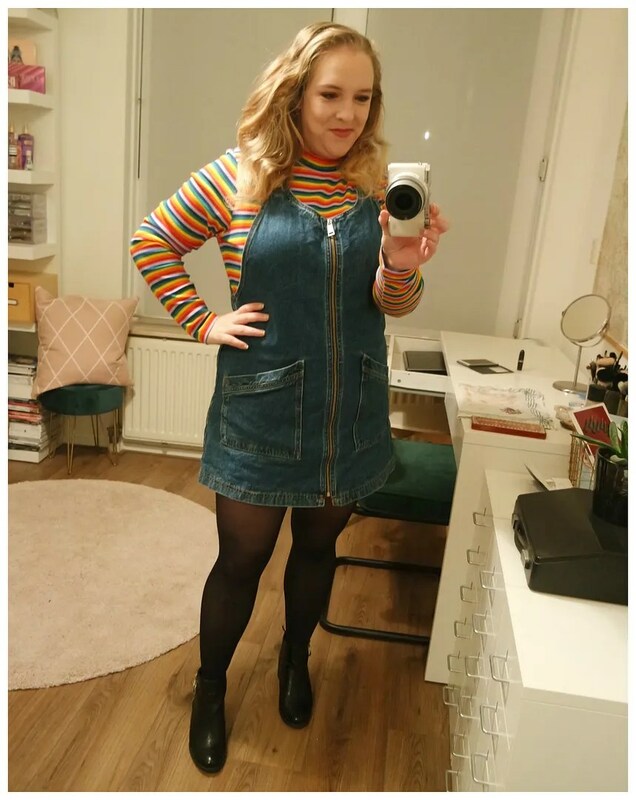 I bought this rainbow top a few months ago from Monki: I really like their striped turtlenecks. They fit me well and they are continuously doing different color scheme. For Rotterdam prime, they did a rainbow version that I snatched up. I love how it brightens up the look and it pairs well with the denim of the pinafore dress. Thanks! I am really liking fashion at the moment.